This review was first posted after “A United Kingdom” screened at the 2016 Toronto International Film Festival. “A United Kingdom,” the new film from “Belle” director Amma Asante, will probably be saddled with that label more than any other film that has played at TIFF so far this year — and while that might be an unfair reduction of a love story of some consequence, it’s not an inaccurate one. On a day that saw bold films like “Nocturnal Animals,” “Arrival” and “The Birth of a Nation” screen in Toronto, “A United Kingdom” felt old hat, not fresh. In a bit of movie-business synchronicity, the film is one of two different dramas that will deal with interracial marriages this fall, with the other being Jeff Nichols‘ “Loving,” which premiered in Cannes and is also playing at TIFF. That film dealt with the charged environment of race relations in the American South during the 1950s and ’60s, and told its story in the quietest, subtlest way imaginable; though its lead characters went to court and set a hugely important precedent, their point of view was simply that they wanted to live their lives out of the spotlight. “A United Kingdom” is a dramatically different film, with characters who never have the option of anonymity. 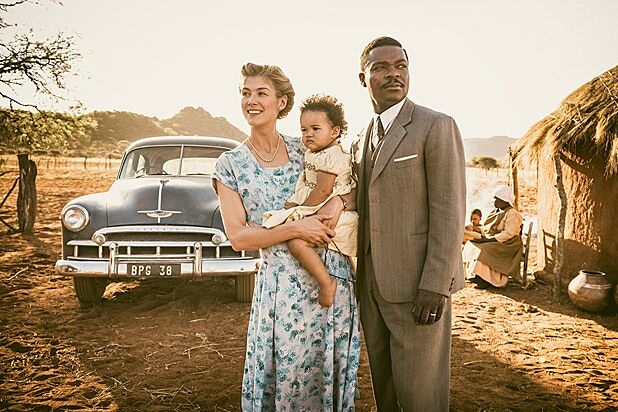 David Oyelowo plays Seretse Khama, a real-life Botswana prince who helped secure the former British protectorate’s independence while controversially married to a white Englishwoman, played by Rosamund Pike. The marriage meets with resistance from his own tribe, but more notably from the British government, which is wary of offending apartheid-era South Africa, on which it depends for gold and uranium. Where Jeff Nichols‘ film relies on understatement and people who don’t say much, “A United Kingdom” is big and old-fashioned, full of stirring speeches and heart-warming moments. That’s not necessarily bad, mind you — as he showed in “Selma,” Oyelowo is pretty great at delivering stirring speeches, and his performance here is typically powerful. And Pike, as a woman who doesn’t know what she’s getting into but has the inner reservoirs of strength to rise to the occasion, knows how to navigate a role that’s significantly less complex and nuanced than, say, “Gone Girl,” in the process creating a woman to root for. The movie as a whole is distinctly crowd-pleasing; it received a rousing ovation at Roy Thomson Hall on Friday evening, and figures to be a favorite for an audience that likes beautifully old-school filmmaking. But the beats are too predictable — and even though the film tells a story we may not have known until now, the storytelling is too familiar. From the beginning, the audience knows that love will win out and the music will swell and the endings will be happy. The formula works, but not well enough to make the film stand out at TIFF or beyond. Never underestimate Bryan Cranston's desire for the intense -- in "Wakefield," he plays a successful lawyer and family man who abandons his loved ones only to observe them at a distance from an attic above the garage. This documentary is the true and inspiring story of Maria Toorpakai, a talented squash player who faces death threats and cultural upheaval in her quest to represent Pakistan in international competitions. In one of the most-discussed titles screening at TIFF, director Adam Leon sets us up on a sketchy errand to deliver a package, and winds up painting a romantic crime caper with a young man and woman. This feature, set in San Francisco's Chinatown in 1960, chronicles the rise of Bruce Lee as a self-taught master of martial arts. Oscar Issac stars opposite Christian Bale and Charlotte Le Bon in the comeback of "Hotel Rwanada" director Terry George, about a love triangle set against the first World War. Another of the most-discussed titles around this year, Walter Hill's action film was described by one buyer as "total madness." Michelle Rodriguez plays a male soldier who undergoes sexual reassignment surgery to become female, at the behest of her scheming superior officer (Sigourney Weaver). Liev Schreiber and Naomi Watts topline one of the starriest sales titles, a fact-based drama about a toxic bachelor and boxer. Indie sensation Bel Powley ("The Diary of a Teenage Girl") returns in Susan Johnson's portrait of a girl genius trying to find a normal life in Manhattan. Not only does this black comedy pit old high school friends Anne Heche and Sandra Oh against each other in a battle royale, the below-the-line talent on this project is almost exclusively female. Director Lone Scherfig ("An Education") returns with a period rom-com centered on the making of an inspirational movie amid the Blitz of London in World War II.